Since we at InovisCoat offer our customers the development of chemical solutions, we take special care to keep the production of our created formulas and recipes secret. Thus, there is no danger of leaking any know-how to other chemical providing companies, which may turn out to be competitors. In this case, formulation is defined as the composition of all necessary individual components to a fully prepared coating batch. 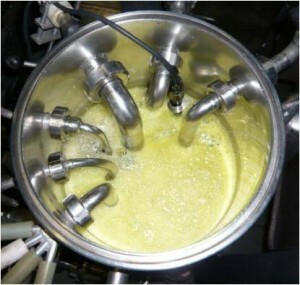 Multilayer coating is defined as the simultaneous application of several identical or different layers on a substrate. 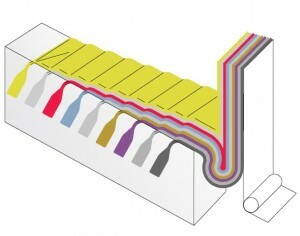 The layer package is built up of different layers in the coater head. Once the package of layers is stable, the coater head is moved to the substrate. Then the package is transferred as a whole and without mixing onto the film, paper or textile. Only through this highly advanced technology has economically viable coating of very thin layers with different functions in ultra-precision become possible. Organic Light Emitting Diodes combine extensive requirements for chemical and process engineering. To achieve the various functions, such as electrical conductivity, light emitting layers and barrier effects to water and oxygen, multiple coatings are necessary. As some of the layers are fragile themselves, the respective functions cannot be applied individually, since the drying processes of the following layers could destroy the preceding layers. Therefore, our technology is suitable for mass production and economically viable. We have invested heavily to make our systems as accurate as possible. Proof of this is that we do not only specify the value of layer thickness over the coating width, but also over the complete length of the coating. This makes our values 6,000 times more accurate! We are able to measure even the thinnest layers with deviations of less than 2% per track (max. 6,000 m)!